It’s wedding season and I love it! Every bride has certain must-haves that make their wedding their own. It’s these pieces that they’ll look back on with pride and adoration as they think back to their “I-dos”. It’s only fitting then that these special items get the right treatment after the wedding to keep the memories preserved and going strong long after the big day. A lot of brides choose to attach a piece of lace from great grandma’s wedding gown to the inside of their dress or wrapped around their wedding bouquet to keep tradition alive and their loved ones near. This piece of lace has so many memories and affection associated with it. 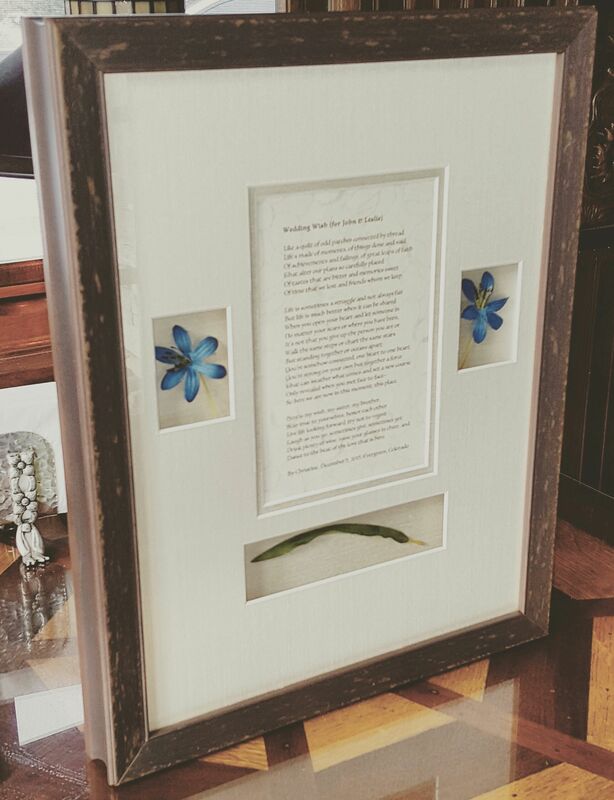 I adore the idea of framing it after the wedding to not only protect it from damage but to have it hang on the wall to honour the special day and that important person. ​A lot of thought goes into flowers. Finding that perfect shade, that unique bloom to make your wedding your very own takes a lot of time. I say that you should get to enjoy them after the wedding! Create a shadow box for your wedding bouquet or mom’s corsage to look upon those lovely florals for many, many years. ​The ceremony of saying “I-do” is such an intimate moment in a wedding. Often couples choose to write their own vows to their partner. Frame them up and hang them in your room for a reminder of your love. ​Toasts are a big part of weddings. Mom, dad, your maid of honour and best man have spent countless hours putting together the right amount of funny with sentiment. Frame up their words along with the top of the champagne bottle to be brought back to that amazing moment in your wedding when family and friends publically welcome you as man and wife for the first time.